Our road safety team has been working alongside Avon and Somerset Police over the summer months to help carry out more than 600 safety checks on child car seats. Hundreds of parents and carers have benefited from the free in-car safety checks which took place in Thornbury, Kingswood, Yate and Patchway between June and September. The large majority of motorists who were stopped and given advice about fitting the seats correctly welcomed the reassurance they received from road safety officers and police officers. Of the 630 checks carried out, we found 272 child car seats that were fitted correctly however more than half of those we came across were incorrectly fitted with 277 children carried in car seats that were not safe or properly adjusted. We found 123 had major faults and 154 with minor faults. Major faults included seats belts requiring re-routing and many of the minor faults were with harnesses that needed adjusting, headrests that had to be removed and twists in the seatbelts. Young people travelling in cars as passengers were also measured to ensure they are the correct height to safely use seatbelts. 48 young people were found to be under the legal limit of 135cm with no booster seat available. 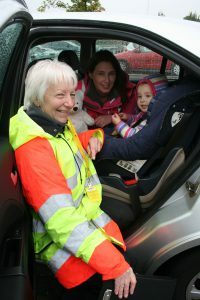 Road safety officer Pamela Williams said: “These car seat safety checks provide a great opportunity to find out from experts the right way to fit in-car child safety seats. Each year around 100,000 children are involved in car accidents in the UK and the way their car seat is fitted can make a huge difference to whether or not they sustain injuries. The best way to protect them is by investing in a properly fitted seat which is the appropriate size for their weight and height. “We check child car seats to ensure that they are fitted correctly and we also educate drivers of the laws concerning child passengers and of potential dangers. The majority of people are really happy that the seat has been checked if any moderations are made they are always very grateful. PC Dave Adams, road safety officer for Avon and Somerset Police, said: “We believe it’s important to support the council in carrying out these safety checks. No one wants children to suffer injury in a car accident and, correctly used, child car seats are designed to help prevent serious injury.